Harrowing drone footage has captured the devastating aftermath of an enormous wildfire in Greece. The fire raged for nearly four days before firefighters finally contained the flames Wednesday. Dozens of houses and thousands hectares of forest were destroyed by the ravenous blaze which began Sunday in the coastal town of Kalamos, approximately 45 kilometers (30 miles) northeast of Athens. The fire quickly spread, aided by the strong and changeable winds as well as the hot weather. Numerous other wildfires sprang up in different parts of the country, which often sees large forest fires at this time of year. Skai TV are reporting that fires are still raging on the island of Cephalonia while a fire on Zakynthos is said to be “improving”. 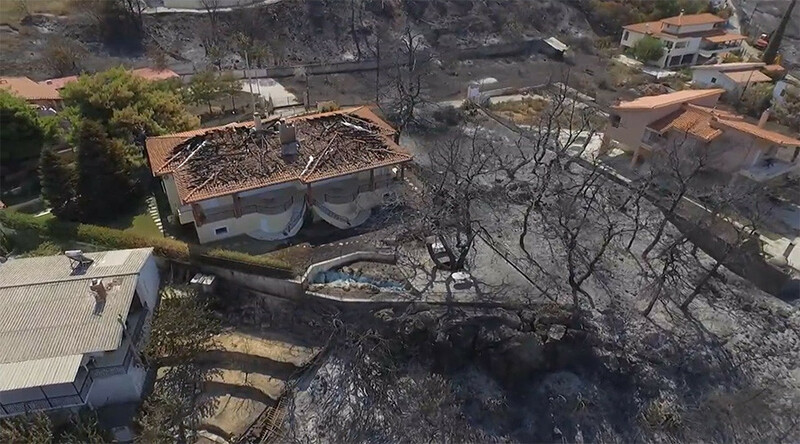 Incredible drone footage captured the aftermath of the destruction caused by the wildfires. It shows acres of scorched earth, with trees reduced to cinders and houses destroyed. The drone lingers over villas which were severely damaged by the inferno. Greek Prime Minister Alexis Tsipras visited one of the worst affected areas Wednesday. He said Greece had "avoided the worst... and we have to be alert," Reuters reported.